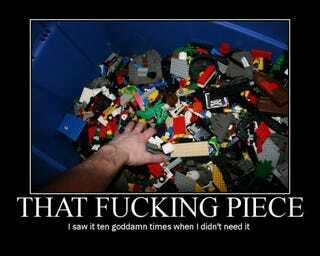 Where's That F*cking Lego Piece? This gets me back. It happened to me most days, when I was a kid. Sometimes I even pretended I didn't really need the piece, thinking that it would magically appear if the Lego Gods thought I wasn't interested anymore. Later, I tried to do the same with girls with identical results.